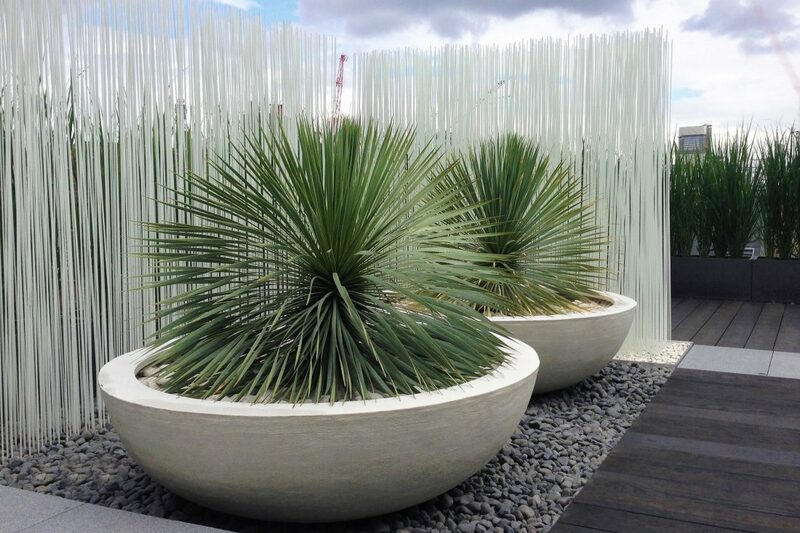 Urbis Design creates contemporary plant containers, furniture and water bowls specifically for garden professionals. At Urbis, we create pure, sculptural forms with integral colours and finely finished textured or metal surfaces. Our advanced glass-reinforced concrete technology enables us to produce chunky architectural statements with a fraction of the weight of conventional cast concrete. This unique process also allows a wide range of finishes to suit any context from traditional modernist concrete to natural stone or even rusted iron and bronze verdigris. We have an exceptionally talented production team, most of whom are artists and designers in their own right. Urbis products are designed and manufactured entirely in-house at our studio works near the city of York. Urbis Design was originally conceived in New York when Richard and Liz Mackness were living in lower Manhattan surrounded by concrete. Craving some greenery in their lives , Richard put his sculpture background to use creating plant containers inspired by his love of form, be it the body, landscape or other natural forms such as shells and the human form. When designing a volume to contain a plant, these contours provide the ideal family of forms. Richard began to create plant containers in Glass Reinforced Concrete, a lightweight mouldable architectural cladding, which proved to be the ideal material. The resulting products are destined to occupy an urban setting, and so share the language of architecture; strong sculptural forms that can stand in their own right as pleasurable objects and also complement the planting. Returning to London, they gradually built up the momentum to become a business and launched Urbis in 2001, first showing at 100%Design the following year. Our stand was mobbed and we haven’t looked back since. Urbis planters and furniture are now used by garden professionals around the world.